Amazon Fire TV Set-Top Box, Do You Need It? Amazon's throwing its hat into the Set-Top Box ring by unveiling the Fire TV, a device that works like Roku or Apple TV in delivering digital content to your TV sets. At the reasonable price of $99, Fire TV is compatible with Netflix, Hulu Plus, Pandora and obviously Amazon Instant Video and Amazon Prime. And while it's compatible with Showtime's digital on demand service Showtime Anytime, it isn't compatible with HBO Go. You may be asking yourself, "Do I need this?" Let's take a closer look at what this device has to offer and how it stacks up against the other devices out there. Note: This is NOT a review of Fire TV. I haven't used the device. This analysis is based the recently released information on Amazon's new set-top box. First of all, if you've never owned a set-top box, I guess the best way to to describe its use is to say that they deliver streaming video content to your TV. You may already be using your smart TV, smart Blu-ray player and/or video game consoles to deliver your Netflix, Amazon Prime and/or other streaming content to your television. A set-top box is an alternative to that, and possibly a better one depending on the interface and speed/quality that your current set-up is offering. And each set-top box seems to come with their own set of additional features beyond streaming videos, like the MP3 and image streaming that Fire TV offers, for example. A set-top box will require a wifi connection to access that online content you're trying to send to your TV, but as it's hooked up to your home network, you might also get home-sharing capabilities, depending on the device. As is the case with a tablet or a smart phone, which one to get and whether or not you really need it probably depends a lot on what you'd be using it for. What does Fire TV offer? Voice search "that actually works" - You should be able to speak the name of a movie, TV show, actor, director or genre into the remote and it'll give you what you ask for. Quad-core processor has more than 3x the processing power of its competitors (Apple TV, Chromecast, Roku 3). There's a dedicated GPU, 4x the memory of the mentioned competitors and "stunning 1080p HD video and immersive Dolby Digital Plus surround sound. Easy to use - it arrives pre-registered so you should be able to just plug it in and start watching right out of the box. ASAP feature guesses what you like and pre-buffers them so they're ready to watch once you hit play. Fling Amazon TV shows and movies from your phone or tablet to your Fire TV using Second Screen. Mirror content from your Kindle Fire to your TV. Amazon says this will be available for iPad/iPhone later this year, and "You can also wirelessly mirror your tablet display to your Fire TV with Kindle Fire, as well as other Miracast-enabled phones or tablets starting later this year." Good games at a good price - Amazon's release lists Minecraft, Monsters University, The Walking Dead and other games among the ones available to play through Fire TV and the average price for them is about $1.85. You can play the games with the Fire TV remote or Amazon's gaming controller. Amazon FreeTime helps you monitor how your kids use it, when they use it and how often. Trying to find a way to limit your kid's digital video and game intake? Seems like this'd be the way to do it, as FreeTime lets parents set limits on what their kids see and set time limits for types of content and times of day. Note that FreeTime Unlimited is a subscription service, and if you're a parent and a Kindle Fire owner, you may already be familiar with it. X-Ray for movies lets you see more info about movies, TV shows and music. That's another Kindle feature that appears to be adapted for this new device. Use it to see your pictures and videos on your TV through Amazon's Cloud device. Use it to stream music through your TV - It's compatible with Pandora and also Amazon MP3, iHeartRadio and more. 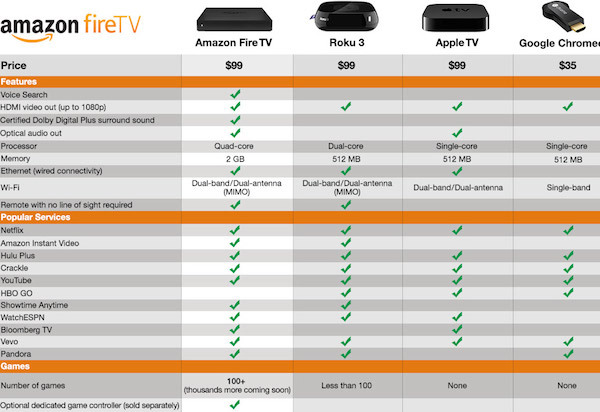 How does it stack up against Roku and Apple TV? I'll preface this by saying that I just bought an Apple TV a couple of months ago and I'm really happy with it. I was having buffering issues with Netflix on my Sony Blu-ray player, and I wanted a device that would let me stream HBO Go through my TV. Apple TV hasn't let me down in that regard, and it's finally letting me make use of all of the iTunes-compatible digital copies of movies I own from Blu-ray purchases. And I can use Apple TV to turn my television into a second screen for my Mac, which has proven to be useful on numerous occasions, mainly for work-related reasons. So in terms of my own personal interests and experience, I'm looking a bit closer at how Fire TV stacks up with Apple TV. But Roku definitely factors into this situation, considering its own offerings. Take a look at the above image to see the compatibility of these devices with some of the popular streaming apps. Apple TV isn't compatible with Amazon Instant Video or Amazon Prime. You can stream it through AirPlay, but that's an inconvenient work-around in my opinion and not the best option. I've continued to use my Sony Blu-ray player for Amazon Instant and Prime video and haven't had nearly as many buffering problems with Amazon as I was with Netflix there, so that's fine. Roku does have Amazon/Prime video capability. Apple TV isn't compatible with Showtime Anytime. Amazon's Fire TV is, though the trade-off there is that Fire TV isn't HBO Go compatible. Roku is compatible with both Showtime and HBO's streaming apps. Amazon Fire TV also isn't compatible with iTunes purchase/rentals. At least, I'm assuming it isn't. Amazon doesn't even mention iTunes on their list of Popular services. Like Apple TV, Fire TV is compatible with ABC's app, but I wish all of these devices had more network and cable TV app compatibility because then I wouldn't need to rely on my cable box's clunky On Demand system. Is $99 a good price? Amazon's $99 price tag for Fire TV is reasonable but not exactly super competitive. Apple TV retails at the same price, though I got my Apple TV for $84 on Amazon back in February and it's up to $93 right now. Still, Fire TV's price is fine, but it's evident Amazon's not looking to go the "look how much cheaper ours is" approach that they took when they released the Kindle Fire, which was and still is significantly cheaper than the Apple iPad. Right now, the $99 price is a few bucks more than Roku and Apple TV, and a lot more than Chromecast. But... Do I really need it? There's this part of my brain that seems to salivate at the sight of a new gadget, particularly as it relates to Amazon. As a long-time customer of the online site, I'm a fan of Amazon the way I'm a fan of Apple. And I want all the toys. But Apple beat Amazon to this and right now, Apple TV's getting most of the job done for me. My cable box and Blu-ray player are getting the rest of the job done. The voice feature is intriguing but I'd like to see that tested out and used to see how useful it really is. Frankly, I'm surprised Apple TV hasn't worked Siri into its platform, so Amazon gets points for being ahead of the game. The FreeTime feature seems like it'd be a hit with parents, but that's not applicable to me for the time being. And though I've recently begun to appreciate the addictiveness of Minecraft, I don't see myself making much use of the gaming capabilities. But these are features that might prove to be much more enticing to you depending on your own personal interests. Fire TV looks like it's giving its competitors a run for its money, not only in power and presumed ease of use but also in its compatibility of popular apps. Lack of HBO Go is too noticeable not to point out though, so I'm curious to know why they weren't able to nail that one down, or if they're still working on making that happen in the near(ish) future. Fire TV has its perks, and if you're in the market for a set-top box, I'd say this one is definitely worth considering on sight alone, but you may want to wait to see some actual reviews before deciding on the purchase. That's at your discretion. But if you already own Apple TV or Roku, it's a much tougher call and likely comes down to what you're using your set-top box for already and whether or not you have any personal need for the additional features Amazon's offering. Do you need Amazon Fire TV? I have no use for a device like this. I own other devices to stream content but I still want Fire TV! No, I use my smart TV or Blu-ray player to stream content. No, I use a gaming console to stream content. No, I own Apple TV.